DISCONTINUED. 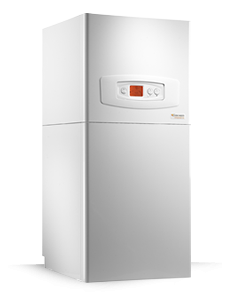 The Ultrapower 100 SXI 24kW Combi Gas Boiler by Glow-worm. I have lived with this boiler for 3 weeks now. The advantages of mains pressure hot water apply to all such boilers. Of course, with a tank, this boiler can deliver a high flow rate and fill a bath quickly, replenishing the hot water in the tank as it does so. I chose a storage boiler to be able to fill a bath quickly and to avoid having a separate boiler and tank. The boiler is in the airing cupboard and I have liberated space in the kitchen now where the old boiler used to be. So far, there are just two minor criticisms. Firstly, if you have had the boiler off and have only cold water in the internal cylinder and you suddenly want hot water you have to wait a couple of minutes. A more intelligent design would bypass the heating loop of the tank in favour of delivering hot water from the boiler straight to the tap. The second criticism is minor: instead of displaying the target domestic hot water temperature, it would be more useful to display the actual temperature of the tank. This would tell you whether the boiler needs to be switched on to deliver hot water. I will add to this review when I have lived through a winter with the boiler and have had a chance to observe its reliability.